13 Responses to Why I prefer to look for books in stores rather than online. I heard Jesus was going to do a signing at Barnes & Noble, but after the less than stellar accommodations He was forced to endure at birth, he’s got kind of a barn complex. Please open it! We need to know whether the Bible was written by a man or a woman. Are there a couple of stone tablets inside? Now that you mention it, it is really heavy! 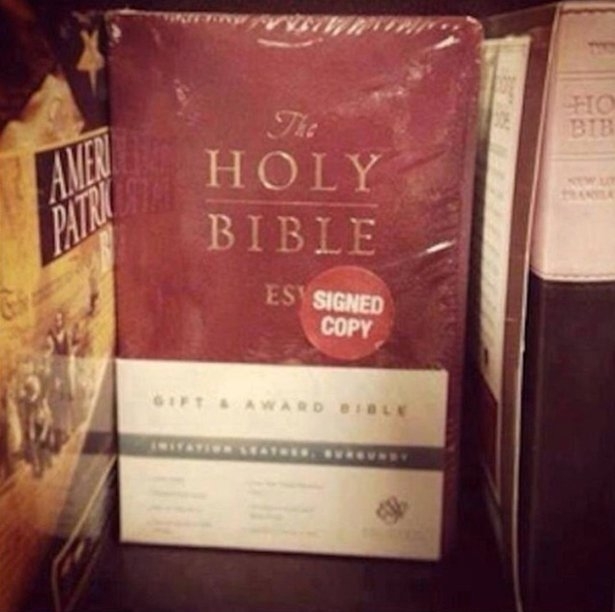 I guess so, I mean it has a sticker on it! How do we know the signature is real? Is there an author photo too? I’m not gonna lie Don Don’s, I haven’t opened it! And we know that Samson was the greatest comedian in The Bible because he brought the house down! Right. I heard he killed at the Philistine Temple. hahahaha! Great photo! I keep buying actual books, but I tend to read off my Kindle. Go figure.